It looks to like you input some wrong numbers. at 31.99 you should have just at 65534 sectors. and only on partition instead of your requested 2. I should probably re view the Video about 5 times to verify this, but coffee is now ready. Software bug: not telling the user he's forgotten (or did he really "forget"?) to define the size of the APT. Human bug: not putting an APT on the disk. D'Oh! When you get around to fix later ... would you also repair the toggle bits under the VIEW heading so the selected item actually preforms the function. my CF CARD have 8GB..
what is FAT MB size and what is APT MB size? Erm... FAT MB size is the size of the FAT in megabytes. Meanwhile, APT MB size is the size of the APT in megabytes. So if you want a 2GB FAT, type 2048 in the FAT MB box and so on. In short, APT is a partition table design for the A8. MBR (a partition table design often used on the PC) was deemed unsuitable for the A8 for several reasons, so APT was born. It provides for a "protective" MBR so that your PC OS won't obliterate your Atari partitions, and facilitates (recently) "external" links to FAT partitions on the same media. Thus can FAT data be accessed in a controlled way (via drivers and software) on the A8, while also remaining accessible by your PC. APT is also the container for conventional A8 hard disk partitions (generally those formatted in a file system your PC can't access directly). SDX can't read FAT without a driver. We have FATFS.SYS, which can read a FAT16 partition of up to 32MB. But you need to set that up as I've described umpteen times and made a tutorial video about. 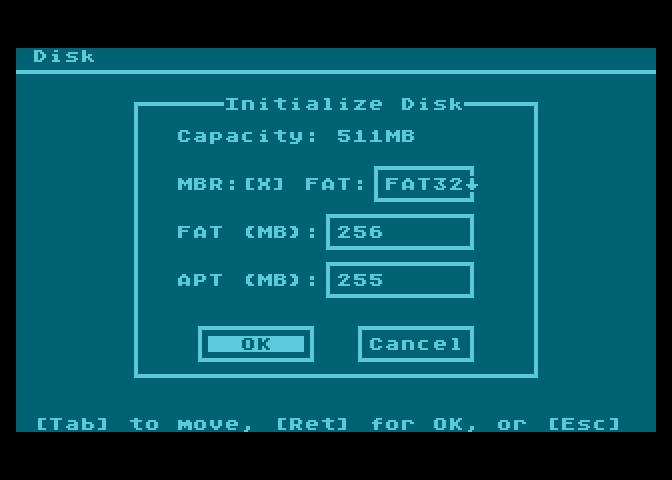 Without that FATFS driver and that FAT16 partition of just the right size, set up just the right way, Atari DOS (SDX, or any other) can only see partitions in the APT, and the XEX loader can see your ATRs/XEXs in the FAT area. Edited by flashjazzcat, Sun Nov 10, 2013 2:37 PM. i dont understand.. i must testing it myself..
so.. if i have 8gb card.. i choose FAT 8000mb and APT.. 512mb maybe.. or? Edited by w1k, Sun Nov 10, 2013 2:43 PM. Do... and watch the video as well. but in video is choose only FAT, no APT..
so.. i create FREE SPACE 512mb FAT and APT is for partitions for this 'free space'? but if i a create 512mb fat and 100mb APT, where is that 412mb..? i dont understand that..
Urgh... video was made before there was any software (FDISK) capable of creating these kinds of FAT entries, so I guess I need to make a new video. And write an updated manual... ah, the joys. Do you want to use the FATFS driver as shown in the video? If so, fire up FDISK 4, go to "Initialize disk", create a 31MB FAT16 and an APT of any size you like. Then, in the APT editor which appears next, choose Partition->Make External, and choose the FAT16 partition you created earlier. Give the external partition a drive letter. Now, take the CF card, put it in the PC, and format it FAT16, 4 or 8KB clusters. Now copy some Atari files onto it. Then put it back in the A8, fire up SDX, and install the FATFS driver. You should be able to do a "DIR" on the FAT16 partition. i using FAT32 and windows 8 doesnt support FAT16 formatting.. i understand now.. finnaly..
Edited by w1k, Sun Nov 10, 2013 3:15 PM. What does the initialization dialog report the overall disk size as at the top, in MB? Edited by flashjazzcat, Sun Nov 10, 2013 3:34 PM. Edited by atari8warez, Sun Nov 10, 2013 8:16 PM. Yep - it's buggy as hell, as I've said. Haven't done anything with it in months. In the absence of another tool for the job, don't use it until I've fixed it. Would I be able to use a CF that I prepared for use with MyBIOS (for MyIDE 2)? It's a 4GB card, with 3 partitions. 1st is FAT32, 2nd APT [empty afaik as I've never run sdx and MyIDE has no other tools for it beside MyNBIOS creation step] and the 3rd is the proprietary MyIDE format. In MyBIOS there's not much that can be set, it's always 50% and 50% for FAT32/Proprietary, if an APT is required then the first 1/2 is divided again so 25% is FAT32, 25% is APT and 50% is proprietary. My main goal is to manage to flash U1MB as I see fit from the related flasher ATR and something tells me that out of the box U1MB and MyIDE2 won't play nice, hence the SIDE2 as the middle man. Judging by the video you sent, this works as designed. Selecting View->Show Megabytes toggles the display between sectors and megabytes, and View->Show Names toggles the display between standard view and a view where all the partition names are listed in the main window, with the details appearing where the partition names would normally be. When active, both views are marked with a symbol next to them in the menu. I noticed a couple of your posts over at AtariMax. The geometry options provided by MyBIOS certainly seem rather inflexible. However, providing the MBR on the card has an APT (type $7F) entry in it, the APT drivers and tools should happily work with it, ignoring the proprietary MyIDE partitioned area (I have no idea of the design ethos behind that, BTW: I assume that like APT it's some kind of container... it would have been easier if they'd gone with the pre-existing APT design instead of incompatible partition table standard number 1,438... hence the need for the "middle man". ). Similarly, the shared FAT area should be usable with the APT tools. I guess the proof will be in the pudding, so to speak. I'm not personally geared up for testing this combo, but I'll fix anything that's broke within reason. The only way to get an APT onto the card using FDISK is to prepare the media from the ground up using that application: it's not possible to just "drop" an APT into an existing partition structure. However, there's nothing stopping you doing so with a Windows-based partition editor or similar. FDISK should then pick up the APT entry in the existing disk structure and allow you to partition the space. Regarding U1MB: while it provides full PBI HDD support for SIDE 2, it's not possible to do so for MyIDE because its IDE registers clash with U1MB's RAM. 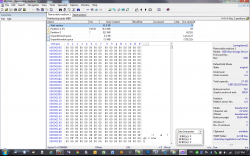 However, you can still use MyIDE with MyBIOS - flashed to the U1MB - or with the SDX soft-driver. SIDE2 is definitely the more compatible option when it comes to hard disks, though. Edited by flashjazzcat, Tue Nov 12, 2013 5:55 AM. The Device Selector shows the name of the interface as well as the controller. When using multiple devices, this should help to identify which is which. As previously mentioned, the Device Selector will pick up all APT-compliant devices on the system, regardless of whether they are PBI or soft-driver devices. This means you can individually partition IDE Plus and the SIDE soft-driver, for example, with both present and active. 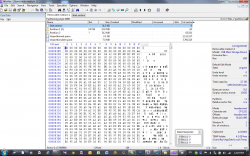 The APT PBI drivers for U1MB, Incognito, and IDEa and the soft-drivers for SIDE and MyIDE all report back a hardware ID string. IDE Plus 2.0 doesn't (yet); detection of that interface is therefore based on magic bytes. I'll assume the view bug Roy reported doesn't exist since my enquiries in that department reached an abrupt dead-end. Edited by flashjazzcat, Tue Nov 12, 2013 8:12 PM. Post sector 0 of the card, please, so I can have a look. 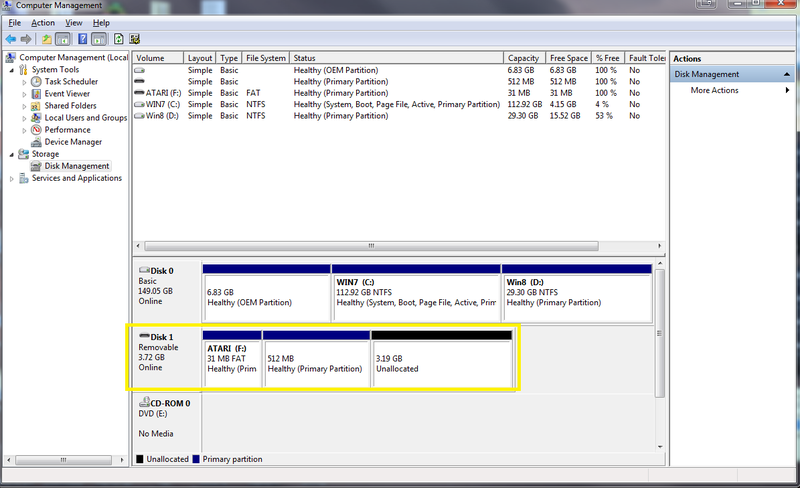 I need to know the MBR partition ID, and a look at the FAT partition's boot sector would be helpful. Also whether the FAT partition was created by FDISK or with a PC-based utility. Edited by flashjazzcat, Wed Nov 13, 2013 6:55 AM. 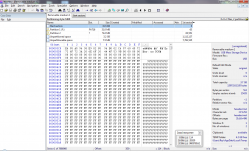 FAT Partition was created by FDISK and later formatted by Windows 7 x64 disk management module. No special windows drivers were used to access the CF card. 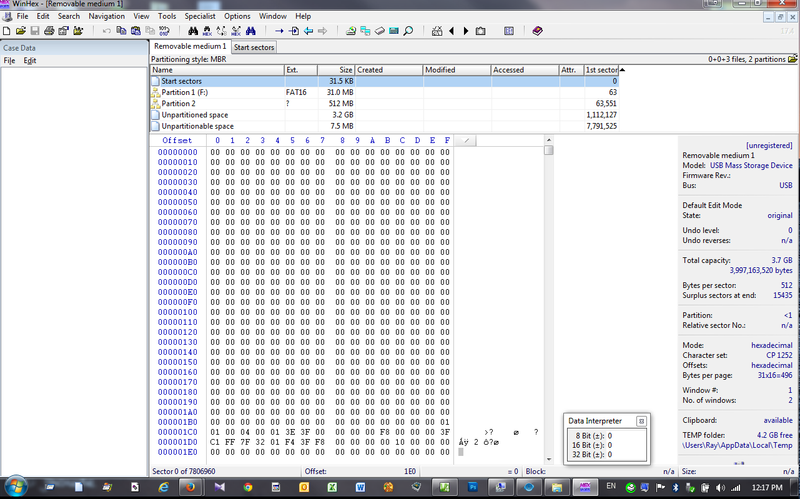 Looks like the first 431 bytes are all 0. Edited by atari8warez, Wed Nov 13, 2013 11:58 AM. OK: Thanks for that. FDISK wrote out type $06 (FAT16 partition with 65536 or more sectors) and Windows apparently changed it (quite reasonably) to type $04 (FAT16 with less than 65536 sectors). 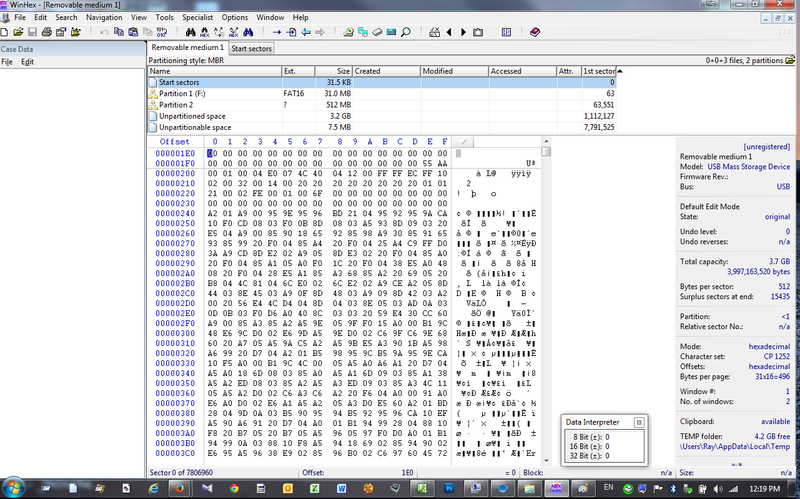 I'll add detection code for type $04 and ensure FDISK writes type $04 if the partition is FAT16 and less than 32MB. 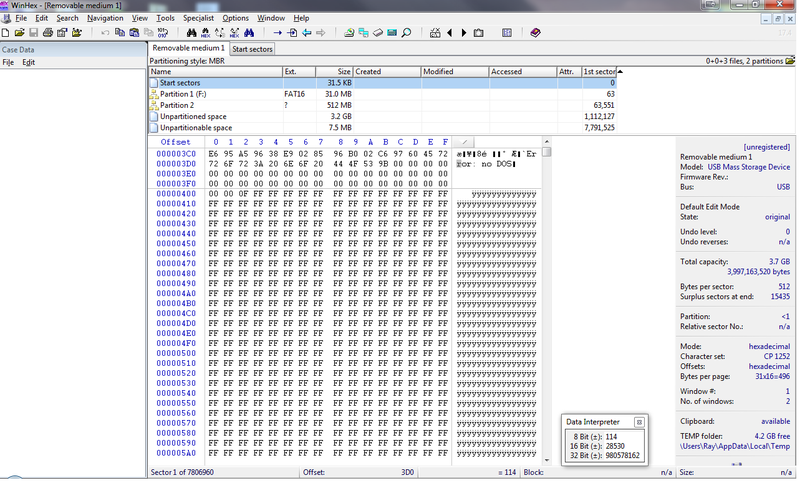 First 447 bytes are zero in Sector 0 - Part 1 . The MBR partition table starts at byte 446 ($1BE); the space before this is for PC boot sector code and not applicable here. Anyway: recognizing type $04 is the most important thing to fix, but we might as well write out the correct ID in the first place too. Edited by flashjazzcat, Wed Nov 13, 2013 12:43 PM.